New replacement speedometer release clip holds the speedometer onto the back of the speedometer cable. 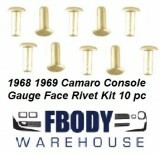 Complete hardware kit to assemble 68-69 console gauges. 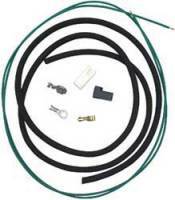 Kit contains ground wire to get the job done right the first time. Assemble a new gauge kit or repair your original with this complete hardware kit. 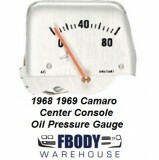 This is a new replacement center console mounted oil pressure gauge for use on 1967 Camaro models with console mounted gauge package. 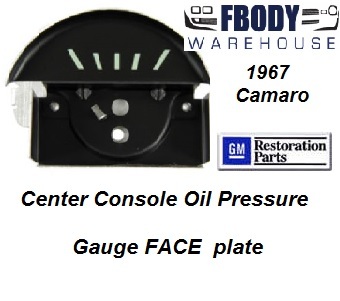 This is a new replacement center console mounted oil pressure gauge FACE PLATE for use on 1967 Camaro models with console mounted gauge package. 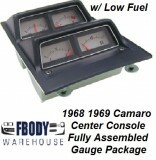 This is a new replacement center console mounted gas gauge FACE PLATE for use on 1967 Camaro models with console mounted gauge package. The console fuel gauge is hard to see! 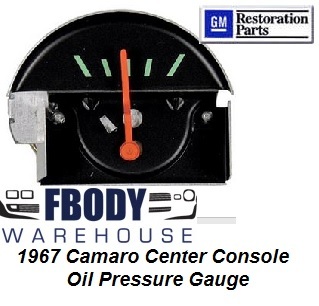 All original factory console gauge option Camaros included a visual Low Fuel warning light in the dash. 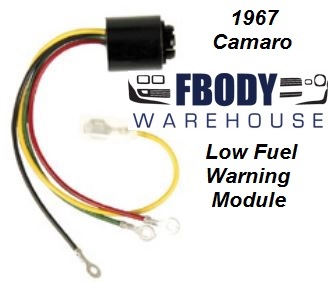 Exceptional quality, USA made Low Fuel module installs as original to the back of the 67 console gauge assembly. May be used with other vehicles. 1967 Module provides + battery voltage to an indicator light. (1968-69 Module provides a Ground to an indicator light.) With instructions for Camaro. 5 year warranty. Officially Licensed GM Restoration Parts. This is a new replacement center console mounted temp / volts gauge rear mounting plate for the console mounted gauge pod. For use on 1968 1969 Camaro with center console mounted gauge pod. 1968 1969 Camaro Gauge Face pop rivets for center console gauge faces.Rivets, correct, for replacing silver gauge face plates (pack of 10). 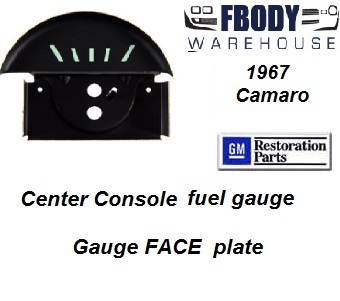 This is a new replacement center console mounted fuel gauge FACE PLATE for use on 1968 1969 Camaro models with console mounted gauge package. 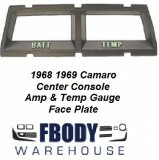 This is a new replacement center console mounted temp gauge FACE PLATE for use on 1968 1969 Camaro models with console mounted gauge package. 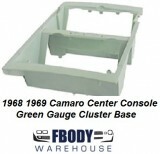 1968 - 1969 Camaro Console Gauge Cluster housing with proper green hue. This is a new replacement unit. 1968 - 1969 Camaro Console Gauge Cluster Trim cover with proper black and chrome accents. 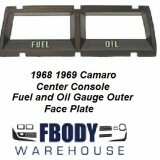 1968 - 1969 Camaro Center console gauge pod trim plate for oil and fuel gauges. 1968 - 1969 Camaro Center console gauge pod trim plate for amp and temp gauges. 1968 - 1969 Camaro Center console gauge pod clear lens Sold as a pair for the center console gauge insert. 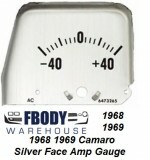 This is a new replacement center console mounted silver volts gauge for use on 1968 1969 Camaro models with console mounted gauge package. 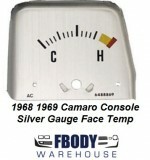 This is a new replacement center console mounted silver temp gauge for use on 1968 1969 Camaro models with console mounted gauge package. 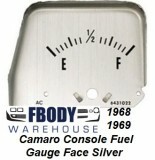 This is a new replacement center console mounted silver gas gauge for use on 1968 1969 Camaro models with console mounted gauge package. 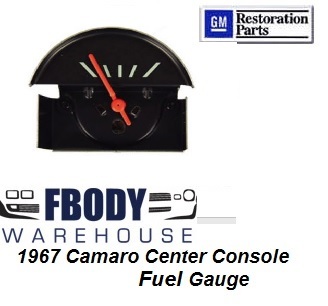 This is a complete fully assembled center console mounted factory replacement silver faced gauge cluster for use on 1968 - 1969 Camaro models. This is a complete fully assembled center console mounted factory replacement silver faced gauge cluster for use on 1968 - 1969 Camaro models. Includes low fuel warning. There are several different styles to choose from so make sure you pick the one you need. 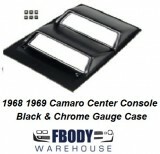 Fbodywarehouse has a video on how to replace these and it also shows where to find your GM part# on the circuit board. You will need that part# to match the new one so you can be sure you get what you need.